Da Silva (0-0, 0.00 ERA) has made one appearance. Despite their limited visibility in the spotlight, the education these young hurlers are receiving behind-the-scenes is what is most impressive and valuable. The sky is the limit for Los Angeles Angels of Anaheim right-handed MLB pitching prospect Aaron Sookee. (New York Mets) and fellow Aussies Chris Oxspring (San Diego Padres) and Brad Thomas (Detroit Tigers), while Alex Da Silva gets to rub shoulders in the dugout with American Jason Hirsh (Houston Astros and Colorado Rockies) and Aussies Travis Blackley (Seattle Mariners and San Francisco Giants) and Shane Lindsay (Chicago White Sox and Los Angeles Dodgers). Aaron Sookee has spent most of his two minor league seasons playing Arizona League Rookie ball with modest success. Last year for the Arizona League Angels, the six-foot-three reliever went 3-3 with three saves and a 4.63 ERA. In 14 appearances, he pitched 23.1 innings and struck out 28. Averaging more than one strike out per inning in both the Arizona League and ABL is an encouraging sign. International scout Grant Weir commented, “The Angels are very excited with the signing of Aaron, and we believe he has an enormous future in professional baseball. He has physical attributes that are going to help him have a long and fruitful career, but more importantly he is a great kid who works hard.” Having a seven-year professional contract with a probable World Series contender a la Pujols, Sookee can potentially develop into a huge Major League Baseball talent over time. It took Aussie Angel predecessor Rich Thompson over five and a half years to make his MLB debut in 2007. Based on the Thompson timetable, Aaron Sookee is right on schedule to have a significant impact on this franchise’s young pitching promise and future. 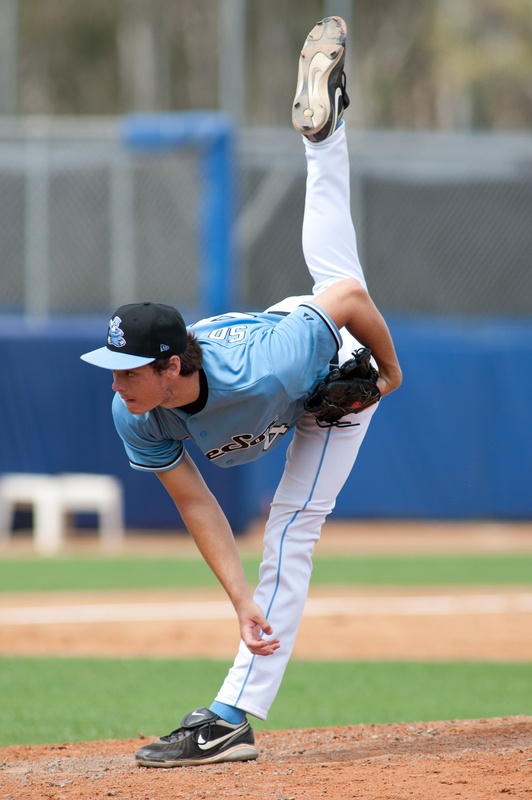 Named MVP of an international competition in America while playing for the Penrith and Sandringham Baseball Clubs and the NSW team in Blacktown, the younger Aussie Alex Da Silva was watched meticulously by MLB scouts during the national youth tournament in Perth and was signed shortly thereafter by Angels’ scout Grant Weir, who was blown away by the velocity of his 90 mph fastball. Ladies' man Alex Da Silva prays for the opportunity to give one-on-one lessons to TV starlet Eva Longoria. 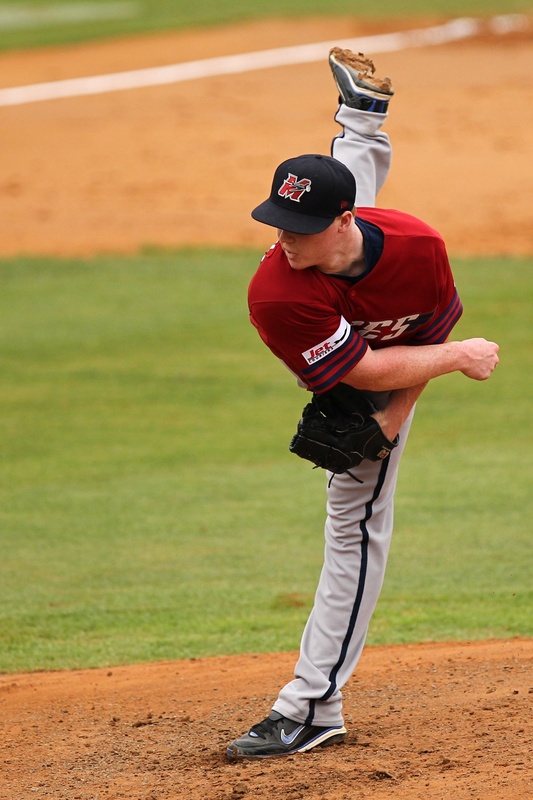 work-in-progress pitcher will join the Arizona Angels’ Rookie Camp in March. Weir said, “Alex probably throws harder than anyone in the country. Just his tools are impressive. He has the fastball, and he just has to learn how to pitch. He’s got the right tools to pitch. But he’ll learn in the right environment.” Da Silva has an uphill battle ahead as he experiences the growing pains of rookie camp with aspirations of turning heads and being selected on one of the organization’s minor league teams. Having followed Alex’s pitching finesse since playing for the U13 development squad, Weir believes Da Silva has what it takes to be successful. Alex Da Silva hopes to play with and catch Holly Madison in MLB. “He’s a smart kid. I think he’s realistic, and he knows that this is just the start for him. There’s a lot of work to be done yet,” Weir said. Beginning his baseball playing days when he was nine years old, Alex’s athletic career has progressed from participating on club teams to Victorian State teams and then on to Australian national squads. Alex feels blessed that he was born with what he called “natural pitching ability that cannot be learned.” Da Silva credits his dad for his six-foot-two stature. He said, “I’m a pretty good build, and I get that from my father’s side so I think I just have naturally improved as a pitcher. I really want to see where my talent can take me. I want to make the Major Leagues.” Given Derek Jeter’s Major League relationships with the likes of Minka Kelly, Mariah Carey, Lara Dutta, Joy Enriquez, Jordana Brewster, Vanessa Minnillo, Vida Guerra, Jessica Alba, Adriana Lima, Jessica Biel, Rachel Uchitel, Tyra Banks and possibly Scarlett Johansson, the future looks bright for both Alex Da Silva’s personal dating life and his potential to join the game’s elite as a pitcher for the LA Angels. I’m so happy to see the Angels actively involved in the hunt for the best players in Australia. 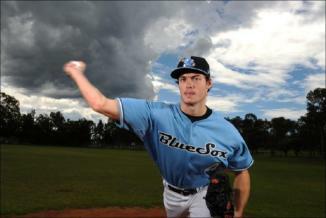 More clubs need to be checking out the slew of talent in the Australian Baseball League. Best of luck to Aaron Sookee and Alex Da Silva! GO ANGELS!! !